And out from underfoot! Let’s chat about how to organize LEGO. If you’ve ever stepped on one of those little bricks in the middle of the night, or spent hours looking for the hair for a specific character figure, you’ll understand the need for keeping all of the LEGO organized in your house! As far as kids are concerned, LEGO is a fabulous toy. Parents have more of a love / hate relationship with the ubiquitous colourful bricks! They love the skills and imagination that playing with LEGO brings to their kids, but they hate the thousands of pieces that end up everywhere in the house. Are you in that boat? Read on! What kind of LEGO kid do you have? Some kids want to build a set EXACTLY per the instructions and then never, ever take it apart. Result? You have interesting creations taking up space on the shelves and no more bricks to play with. Some kids want to build sets based on their own imaginings, eschewing the instructions in favour of creative play. Result? You have no final product but hundreds, if not thousands, of bricks to play with. If they eventually DO want to build it per the instructions, you’re lucky if you can ever find the right pieces again, let alone the booklet. Whichever kind of LEGO mastermind your children are, there are some easy ways you can keep on top of what’s known as ‘LEGO creep’: that inevitable spread of the little bricks throughout your house and home. If your kids tend to be the kind who want to keep the set intact, then do so, but ask them to dismantle it before they start a new one. You can store each set in its original box, complete with instructions, or get a bin with a lid for each one at the dollar store. Either way, all the RIGHT pieces for that set will remain in one place, making it possible for your child to recreate their Minecraft world, or Jedi Temple, with ease. Another option is to keep parts together that are from the same series. For example, if your little Jedi is into Star Wars and has multiple sets from the series, all of those pieces could go into one bin. When they’ve gotten too old for a train table, a LEGO table is the a great way to have a designated LEGO play area and to minimize the brick creep! Lay out some LEGO board on a table with raised edges and let them build! Place buckets underneath the table for storing the extra pieces not currently being used and make it a habit that all playing LEGO stays on the table. Often used for crafting, plastic boxes or trays with compartments in them are perfect for the tiniest of LEGO pieces. Another option is plastic tackle boxes from your local outdoor supply store. You can sort them by type and colour, so that your kids can find exactly what they need even if all their sets are mixed up. Another great idea is to find an old tool box and bring it back to life as a LEGO organizer! Keeping very specific tiny parts in separate compartments makes it easier to find the pieces needed for a set. For example, one bin with compartments could be just about LEGO figures: a section for heads, one for bodies, one for hair, one for hats… you get the idea. Clear plastic or open top bins on a shelf are great for the larger pieces, sorted by colour. You can store by type of brick / shape, but you’re going to need A LOT of bins if you try and do that. Storing by colour makes the most sense, so that when your kid pulls out one of the instruction guides, they can find what they need by then also pulling out the bins with the right colours. It’s an ‘at a glance’ system that requires far fewer storage containers. Another option is to hang buckets on the wall, one for each colour. That makes clean up a little easier at the end of a play session. Or what about a clear plastic shoe organizer? You can hang it behind the door and each pocket can be for a separate brick colour or type? What about the instruction manuals? One neat idea is to get a large size three ring binder with plastic envelopes inside. Put each booklet in an envelope so the kids can flip through and pick one, when they need LEGO-inspiration! However you store the books, keep them all together so that your kids need only go to one place to find them. For the truly LEGO obsessed, what about a LEGO wall? You can glue LEGO boards across a section of the wall and put the bricks and pieces RIGHT on it! With a few bins for the pieces that they don’t want on the wall, and the rest front and center, this toy becomes part of the look of the your kid’s room in a way that none other does! And if there are sets that your child wants to keep intact once built, put them on display on a high shelf. Out of the way of smaller, more destructive hands or paws, the higher shelf isn’t that useful for day to day needs anyway! What if you just want the LEGO out from underfoot fast and without fuss? The easiest way to organize LEGO is to not organize it at all but instead leverage a cool playmat / storage system invented by a mom and dad who were sick of the LEGO creep! Amy and Adam Fazackerley wanted their three kids to enjoy their LEGO but they didn’t want to spend ages re-organizing all those tiny pieces, day in and day out. As the saying goes: necessity it the mother of invention and the Fazackerley’s came up with a solution: the LayNGo. It’s a play mat, storage case and carry case, all in one tidy package. It’s even machine washable! These parents have thought of everything! 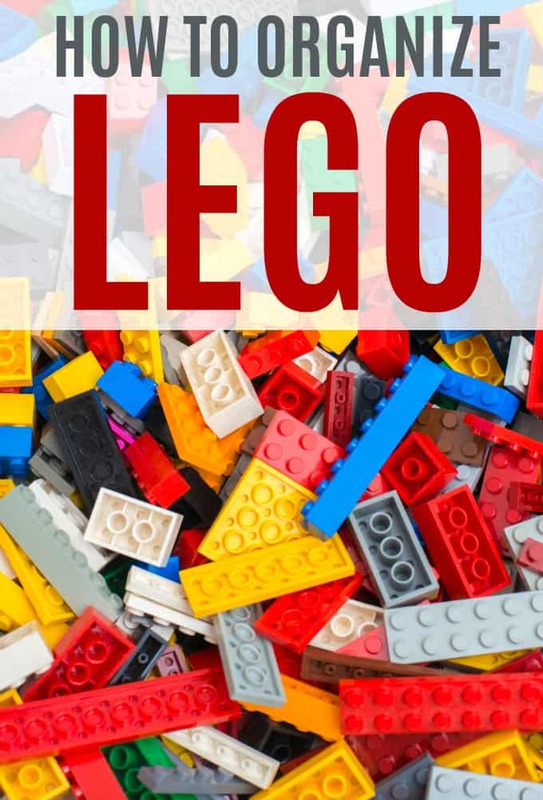 The word LEGO is an abbreviation of the Danish phrase ‘leg godt’, which means ‘play well’. So make sure your kids can play well and you can go to the bathroom at night without incurring foot injuries! Have fun and if you have any LEGO storage tips that I haven’t mentioned here, share them! Thank you! I really need to organize mine. I had save my daughter and son Lego and have a Rubbermaid bucket full. I got them out for my granddaughters 3 and 5. I clean them all, try to find all the piece for each set put them in a Ziploc bag. I didn’t finish this task. Way too many block and my granddaughter likes to build houses and cars. My kids love Lego. They spend a lot of time playing. I love it because it gives a little bit boost to their creativity. My children live asking me for this toy, I confess I never liked it. But I’ll end up buying for them. These are some great ideas–we have way too many Legos in our house! My grandson has a ton of LEGO sets, he loves putting them together and using his imagination to build others on his own. So that we’re not stepping on the little blocks all over the house, organization is the key, thx very much for the helpful suggestions! They never sit idle enough to organize them in my house. I have tried countless times. My kids love Legos. We have several bins with legos and we have tried organizing them but honestly if they are kept off the floor away from my feet then I’am happy. Love Legos, I was surprised that my teen still loved them. He has some on top of his desk in his room right now.